I got involved in research at UNCW my freshman year as a research assistant in Dr. Emslie's lab. He is a marine ornithologist and I helped with projects that him and his graduate students were working on for two years. I was involved in a research project with Rebecka Brasso, a PhD candidate in his lab, involving measuring mercury concentrations in feathers of penguins. 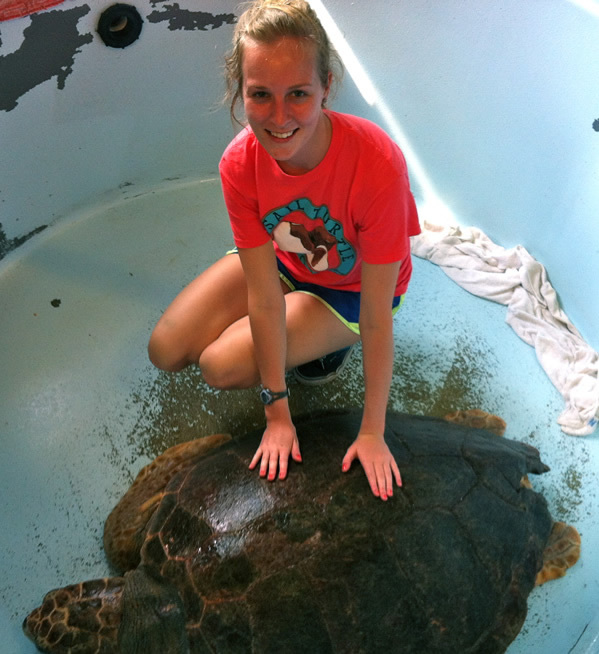 At the end of my sophomore year I was recruited by Dr. Koopman to work on an honors project investigating energy storage in local populations in sea turtles. I have been working on this project ever since and will be graduating in December 2013. It has been a really amazing opportunity to do my honors project in an area of sea turtle research that has not been explored much. No one knows what lipid classes should typically make up sea turtle fats and what anomalies may mean in terms of details of their life history. Contributing sea turtle physiology information from an area of the country where sea turtles are so important has been so much more than I thought I could have accomplished during my time here. For my penguin project I received a Georgia and Gary Miller Undergraduate Research Fellowship in 2012-2013, presented my project at SNCURCS conference at Duke in Fall 2012, and I published my work as second author in the Journal of Environmental Toxicology and Chemistry. I also received a Hosier Undergraduate Research Fellowship in Fall 2013, as well as CSURF supplies grant. I want to get my PhD in biochemistry and work at a research and development or pharmaceutical company doing marine biomedical research.